How to Stream iTunes Videos to Amazon Fire TV ? This Amazon made video-streaming device came into a crowd market which is dominated by well-established devices like Roku and Apple TV on April 2, 2014. Fire TV is designed to stream video and audio content to a high-definition television for enjoyment. The weakness of Fire TV is obvious. On one hand, this market has already had good video-streaming devices like Roku and Apple TV, which beats it in reputation among customers. Besides, Fire TV is pricing at $99 largely higher than Chromecast's $35, which makes it less attractive in price. As long as we give a closer look at Fire TV's specs, we will also find that the strength or superiority of Fire TV over other video-streaming devices is also apparent. The below table lists some unique features of Fire TV that cannot be found among Apple TV, Roku and so on. We can tell from the above table that Amazon Fire TV is still competent and attractive though it enters the market later than others. But the core competitiveness of Fire TV, of course, still lies in its ability to provide more videos for people to enjoy on a big screen. It can support streaming 1080p videos and Dolby Digital Plus 5.1 surround sound, which makes video watching a visual feast. 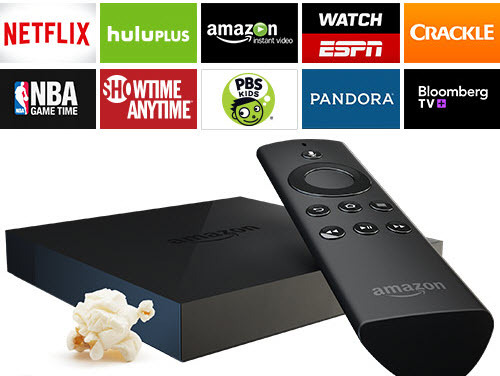 You can not only choose the channels like Youtube and Netflix inside Fire TV to watch videos you want, but also stream videos from outside to Fire TV for watching since it supports bluetooth and has USB port. There is no problem to stream ordinary videos to Fire TV for playback, but iTunes videos which are tightly protected by DRM cannot directly be transferred to Fire TV. We need a DRM Remover to turn iTunes videos into ordinary and unprotected videos in order to enjoy them on Fire TV. 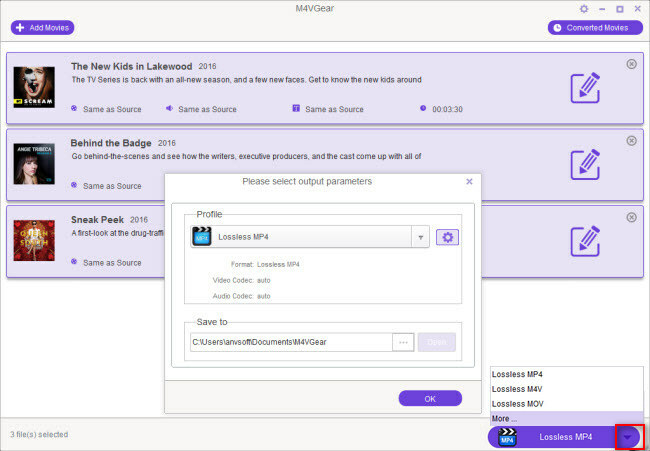 M4VGear DRM Media Converter (Mac / Windows) has been specializing in removing DRM from both iTunes purchases and rentals and converting them to ordinary video and audio formats like MP4, AVI, MP3, etc. The aim of M4VGear is to become the best DRM Removal software and provide the best experience in removing DRM and enjoying DRM-free videos for users. Therefore, M4VGear continues to upgrades itself, such as speeding up the conversion to 20X faster, giving users lossless videos after conversion, adding the feature of keeping all subtitles and audio tracks including 5.1 audio, etc. How to Remove DRM from iTunes Videos with M4VGear ? 1. Download and install M4VGear from below buttons according to your operating system. Please note that the latest version of M4VGear for Windows supports Windows XP, Vista, 7, 8 and 10 (32-bit & 64-bit), while the latest version of M4VGear for Mac works fine on Mac OS X 10.8, 10.9, 10.10, 10.11 and 10.12..
2. 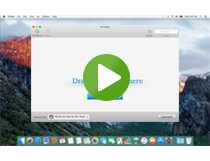 Click "Add Movies" button to add iTunes videos from iTunes library to M4VGear for converting. You can add several videos at one time. 3. Choose output profile for your videos. M4VGear provides output formats like MP4, MPV, AVI and MP3 and output devices like Samsung, iOS devices, PS3 and so on. 4. Click "Lossless MP4" or other output profile button to start removing DRM from iTunes videos and convert them to ordinary formats. 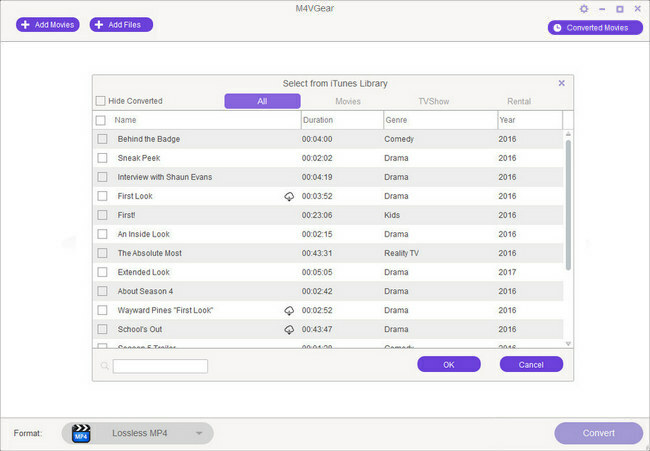 After the conversion of M4VGear is finished, go to the output folder to find those unprotected videos and then stream them to Fire TV through one of the following two methods. Transfer the output videos from your computer to a mobile device with Bluetooth. Then stream the videos from the mobile device to Fire TV via Bluetooth. Transfer the output unprotected videos to your hard drive which will be connected with Fire TV via USB port. Then copy those videos to Fire TV for playback. Note: Before you pay for the license, the trial version of M4VGear can only convert one minute of the entire iTunes videos. If you want the full video converted, buy a full license of M4VGear now at $44.95 from original $49.95.